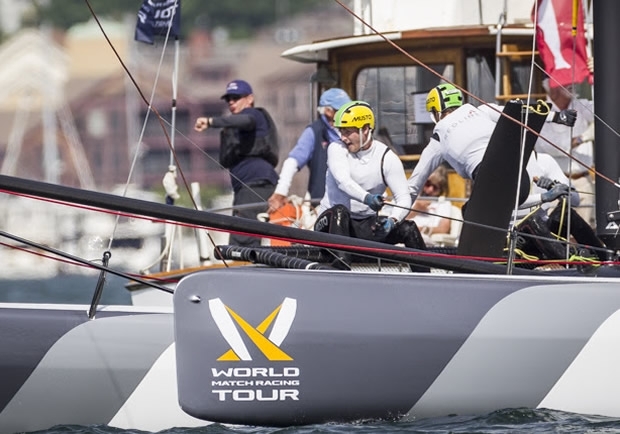 The World Match Racing Tour Newport entered its match racing phase today. While Newport Harbour was fog-free and blessed with sun all day, there was a long pause mid-way through the Qualifying Group Sail-offs as the wind slowly veered from the north into the sea breeze direction of the southeast. But from there it built to a shifty 15 knots, more than enough for the nimble M32 catamarans to fly. The Sail-off matches were held between the bottom two finishers from each of the four groups from the Qualifying round of the first two days. The winner of each of the four Sail-offs got to ‘live another day’ by going through to the next round, the Super 16 Knockout. Among the first to two Sail-offs, it was only Steve Thomas and his RPM Racing team that were able to take out their opponent 2-0. In Thomas’ case this was fellow Perth match racer Keith Swinton’s Team Accure. Finally as the sea breeze established the race management team, led by PRO Mattias Dahlström, was able to get fully into gear. Ultimately Poole beat Monnin, Jerwood beat Walker, while the most hotly contested matched were between two time Olympic gold medallist and round the world sailor Iker Martinez, who won his first against David Gilmour, but lost the second two. In the latter half of the afternoon, the Super 16 Knockout round got underway, comprising eight sets of first to three points matches, the seeding determined by yesterday’s Qualifying results. The top four of the eight pairings got close to match point before proceedings came to an end today. US Virgin Island skipper Taylor Canfield and his US One team actually won three races against Michael Menninger of 13 Fifty Racing, an old rival he has been competing against since they were teenagers in dinghies. However both crews were docked half points for collisions. According to Canfield, the collisions were all very minor, barely scuffing the vinyl. Britain’s six time Match Racing World Champion, Ian Williams and his GAC Pindar crew, finished the day two up against Matt Jerwood as did Nicklas Dackhammar in his series with Johnie Berntsson and his Flux Team; young Swede against older (but baby-faced) Swede. Super 16 Knockoff racing continues tomorrow.